So… did you forget the webinar last night from the Board for Certification of Genealogists? Did you encounter one of those oh-so-common problems, like life getting in the way of genealogy? Are you sitting there this morning wishing you could have spared that hour last night to hear Jean Wilcox Hibben explain “Certified or Certifiable? Why a Genealogist Would Go Through All that Trouble”? She provided a lot of answers to questions about what the benefits of becoming Board-certified are, and what it means to work to standards, and even what the personal and financial rewards of certification can be. Or perhaps it was Jim Baker’s webinar that you now regret missing — his presentation “Elementary, My Dear Watson! Solving Your Genealogy Puzzles with Clues You Already Have” talked about how naming patterns, birth/marriage witness data, inheritance data, sibling research, timelines, family migrations and more can all contribute to a successful resolution to our problems. Maybe you wish you could have sat in when F. Warren Bittner spoke about “Complex Evidence What it is, How it Works, Why it Matters.” He really showed how to take clues from a wide variety of sources, and weave them together in a compelling way to establish identity and prove relationships. Or perhaps you wish now that other chores hadn’t had to take priority when Michael Hait talked about the administration of testate and intestate estates and the records created as a result. His presentation “‘Of Sound Mind and Body’ Using Probate Records in Your Research” showed why probate records are a key element of reasonably exhaustive research. You might have wanted to know more about the kinship determination project — the KDP that is requirement 7 in a BCG applicant’s portfolio. 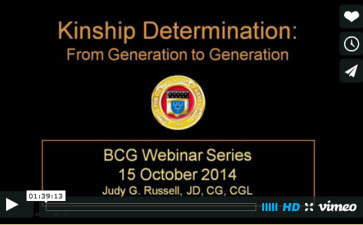 And maybe you had other obligations when The Legal Genealogist presented “Kinship Determination: From Generation to Generation” back in October 2014. You could have just been busy the night that Thomas W. Jones covered the changes in genealogy standards from the old BCG Standards Manual to the new-in-2014 Genealogy Standards book. His discussion of “Fine Wine in a New Bottle: Guidelines for Effective Research and Family Histories” was a must… except when life gets in the way. So what do you do when life gets in the way? You sit in afterwards when life gives you a break. And now, finally, BCG has made it possible for you to do just that. The first five webinars in the BCG webinar series are now available online; the sixth — Jean Hibben’s — will follow soon. Some in the series are and will be free. Most are or will be available to view or purchase for a reasonable fee — a fee, by the way, that’s necessary to ensure that the series continues. So come on over to the BCG website and check out the BCG Webinars page. Do you still have the pdf for the KDP available on your site? I am just beginning to watch your webinar on the BCG website and the address that is in the video for this pdf does not exist. Try it again using the exact upper and lower case as shown — it works (https://legalgenealogist.com/KDP.pdf). The link is not working for me. Can you provide another link? It works just fine for me. Try going to the blog homepage (http://blog.bcgcertification.org/) and using the menu link there.